There's another misinformed meme making its way across my Facebook feed this week. It has been around for at least a year, but it seems like a few conservative websites have been picking it back up, hence its reappearance on Facebook this week. 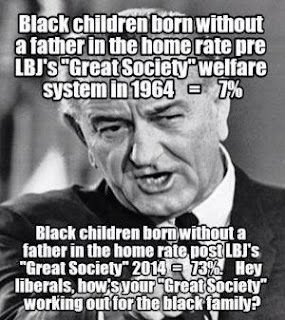 It's a picture of LBJ The text reads Black children born without a father in the home rate pre LBJ's "Great Society" welfare system in 1964 = 7%. Black children born without a father in the home rate post LBJ's "Great Society" 2014 - 73%. Hey, liberals, how's your "Great Society" working out for the black family? One acquaintance of mine who re-posted the meme added "..And the system is actually working just as he designed it! Destroy the black family, make them dependent on government handouts and ensure they will be owned by the Democrats forever! Wake up, America!!! As usual for this sort of thing, the statistics involved have not been cited. I'd like to give the creator of this LBJ meme the benefit of the doubt and say that the sources were omitted for brevity rather than to obscure the facts. It looks like the second figure comes from federal health statistics which states that in 2012, the percentage of black births that were made to unmarried black mothers was 72%. Federal health statistics didn't specifically track african american births to unmarried mothers in 1964, so a direct comparison of statistics is not possible. The best I could come up with is from the U.S. Census data which states that in 1960, about 20% of black children were living with just a mother. That's still an increase, but, it's only 3.65%. It's also worth noting that the fatherlessness rate among whites also rose between 1960 and 2012. In 1960, 6% of white children lived in a single-mother household in 1960. That figure rose to 18 percent in 2013, which means, proportionately, the rate of fatherlessness among white children rose at about the same as black children. I'm also being generous to the meme creator by assuming that "born out of wedlock" and "single parent household" also means "no significant fatherly involvement" which, realistically, probably isn't the case. The other thing to remember here is that correlation does not inherently equal causality. Just because fatherless households rose after the implementation of the Great Society, it does not automatically follow that the Great Society was the cause. Other factors were at work such as the sexual revolution, the marriage penalty and the increase in women in the workforce (just to name a few). These changes had much more to do with the rise of single parent households than The Great Society did. But, in the end, this meme is just an excuse for people to focus their hate downward on the economic laddar and/or to the left of the political spectrum. It's a meme that's meant to rally the base rather than to spur any intellectual discussion.